The story is familiar. The Bank, one of the British “Big Four,” a statured institution with a long and illustrious history, displayed some of the classic struggles in its digital transformation. It had one advantage however: an internal “champion” who knew things could be improved, first, by assembling a Digital team. As one of the largest online banking platforms in Europe, the Bank generally amassed a 1.4 Billion log-ons per year, a number that is continuously increasing. The Bank was packed with talented and motivated people. Unfortunately, their efforts to meet marketplace demand were hobbled by their process, software development life cycle (SDLC), organizational structure, tooling, funding models, lack of Continuous Delivery practices and other factors. With more than 2,000 developers, testers and multiple UI practice teams spread across the globe, the Bank’s development process had fragmented internal teams to the extent that even Business and IT functions were heavily compartmentalized and had competing priorities. In short, the Banks’ people, process, and technology were not efficient in delivering customer value. Digital Transformation is a demanding process that requires time, effort, a strong will to improve, and skilled people with transformation experience. Companies that successfully transform have one thing in common: a ruthless drive to move faster and more efficiently to meet customer needs. It’s not always easy for large, established companies to acknowledge their internal challenges, but the first step of any transformation is a deep and honest evaluation. There’s no one-size-fits-all process for achieving a company’s digital goals, and each will need to adopt different strategies in order to succeed. It’s a daunting task to completely transform a huge, centuries-old institution at its very core. Further, blanket changes would be impractical, time-consuming and not actually effective. It was imperative that we change the bank’s traditional thought culture. We promoted our own best practices and company philosophy. By implementing new strategies and philosophies for small teams, we quickly demonstrated the benefits and made a persuasive case for the company as a whole. This beachhead strategy involved education as well as removing real and perceived obstacles, addressing failures, and celebrating successes. By starting small, we were able to see widespread adoption of our core principles throughout the bank’s E2E group, which was comprised of business, strategic, and technological teams. The massive technological corps was staggering. As mentioned, the bank employed thousands of developers and testers organized in global teams. Predictably these teams contributed to a portfolio of projects that varied greatly in terms of risk and uncertainty. Some projects moved according to steady, predictable timescales, while others progressed almost in real time in relation to a market, customer, regulator, or competitor. A two-speed delivery approach was required. We began by tackling certain foundational activities. SDLC maturity was improved through automation, continuous integration, continuous delivery, metrics, and other methods. Next, based on our examination of the company’s systems and practices, we created a small team for specific, targeted missions. Their mandate was to take a trial and error approach to solving identified problems. Positive changes were evangelized by the team to the bank at large. Some of the missions included Per Team Test Environments, Automated Functional Testing, Automated Builds, Service Virtualization, Up-Skilling People, Test Driven Development, and Code Quality Improvements. “People should have fact-based conversations,” is one of our favorite mottos. Unfortunately, many companies run on guesswork and intuition more frequently than concrete data. We believe in using data, metrics, and analysis to gain insight to a multitude of points and processes along the E2E SDLC. If implemented successfully, these management information streams enable us to spot potential problems long before they cause serious harm. They also aid us in accurately evaluating the project’s status and progress. There are several levels of metrics depending on the information and feedback needed. We group levels into three classifications: Portfolio, Program, and Software. Portfolio: You have fine grained control – The E2E system is Predictive, Proactive and Performant. Portfolio management is prevalent throughout the organisation, transparency and visibility is embedded into individual projects in a consistent and methodical way. Managers are able to keep tabs on individual projects, tracking them throughout their lifecycles and quickly identifying areas in need of further attention. Project: A manager can drill down into each project, and based on hard facts including demand, quality, defects, and efforts, monitor each project’s path to release. Project timelines and cost can be forecasted with a high degree of accuracy. Software: The true test is safely deployed working software. Quality is embedded everywhere, Continuous Delivery practices tackle blockages in the process. Automation techniques realize efficiencies and unleash talent potential within the organization. There is seamless execution when deploying to production. For the bank, improvements were dramatic. 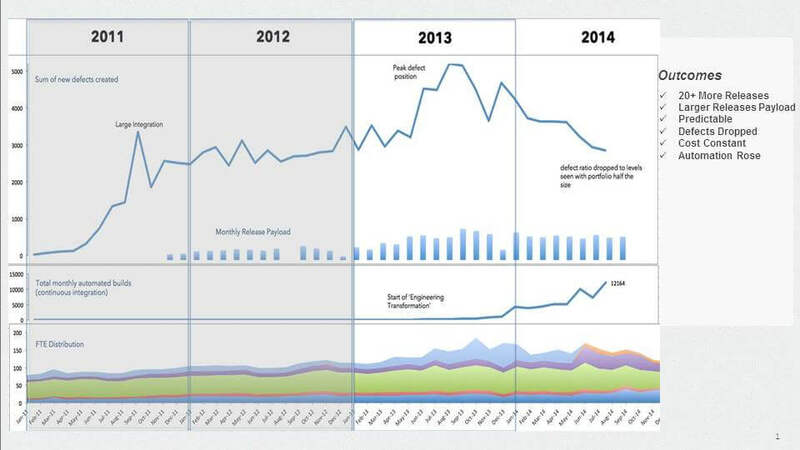 Releases went from quarterly to twice monthly, while the release payload more than tripled in value and maintained predictability, automation rose, defects dropped, and cost stayed largely constant. The bank is now able to quickly respond to marketplace demands, and insure their customers have the absolute best online banking experience. This “Big Four” bank is a dramatic example of what companies stand to gain through digital transformation. To achieve true success, modern businesses need to follow a similar, methodical survey and curative.